In brief: The few things we have tried have all been good, but the dry sauteed string beans and ma po tofu are what we go back for time and time again. 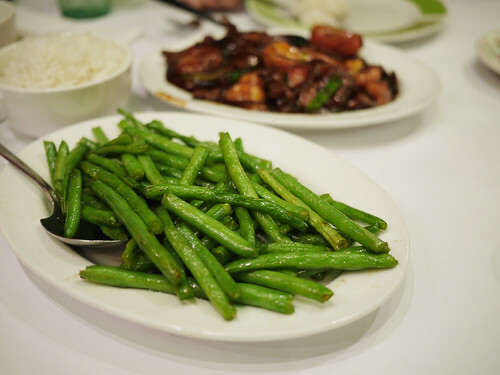 These may look like the most ordinary plate of green beans but we assure you it is not. Homes Kitchen is practically the only viable Chinese option around here so it's pretty packed at lunchtime. But the tables move quickly enough and after a 7 minute wait, we sat down to our new favorite lunch special combo - the perfectly flavored, perfectly dry sauteed green beans and a large flat bowl of mapo tofu. Thanks to Hong, we tried a third lunch special - beef with tomatos, onions in a black bean sauce. A smidgeon on the sweet side, but oh so tender beef.